Westminster Ceiling Tiles is rated 5.0 out of 5 by 14. Coffered ceiling tiles will turn your drab drop ceiling into a dynamic design element, and Westminster Ceiling Tiles will give you more design bang for your buck than any other coffered tile on the market. Made from our Feather-Light Series 0.013 in. thick vinyl plastic, they are unlike any ceiling tile you will ever see or feel. You may be surprised by their minimal weight, but their thermoformed design combined with the inherent strength of vinyl makes these tiles rigid, durable, and easy to install and maintain. Can these be painted to match a specific color? I was thinking of spraying these but wanted to check first. Thanks! Most definitely! All of our ceiling tiles (and decorative strips and decorative grid tape) can be painted right out of the box or after you install them. A couple of notes: - Painting voids all fire ratings and approvals. - Always paint-match the actual products that you are planning on installing. - Do not use solvent-type thinners and cleaners. How many tiles are in a case? Ceilume ceiling tiles are sold by the tile, not by the case, so you can purchase the exact number you need for your order. Feel free to give us a call at 800-557-0654 to request a free sample or with any other questions. Can these be installed upside down? 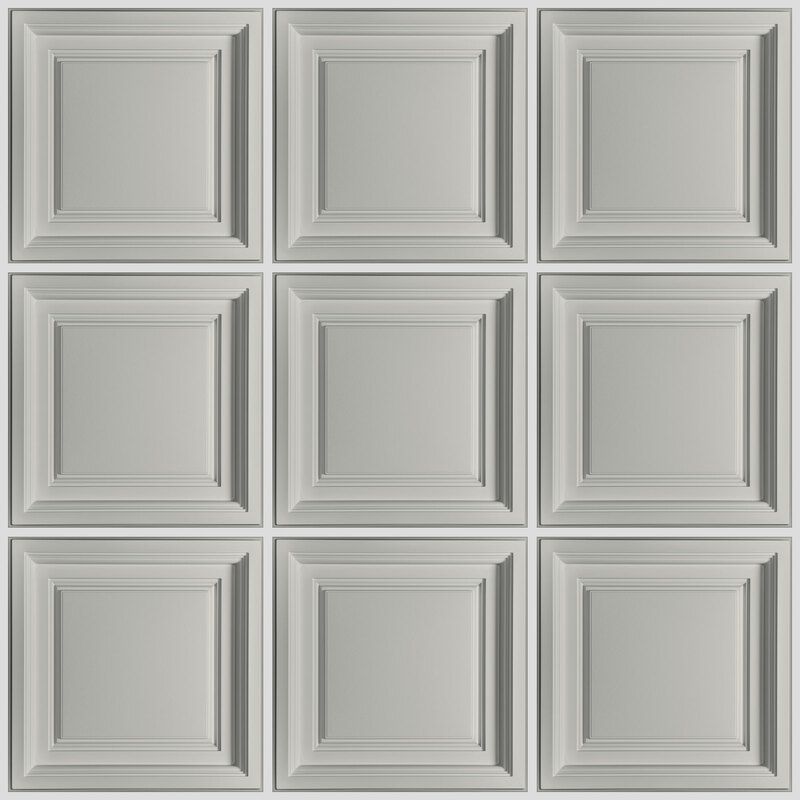 While the Westminster coffered tile &quot;can&quot; be installed upside down, it is somewhat difficult to do. The Westminster has a lip around the perimeter of the back side of the tile which provides additional stiffness to the tile. This lip prevents the inverted Westminster from projecting down far enough to create a dramatic effect. 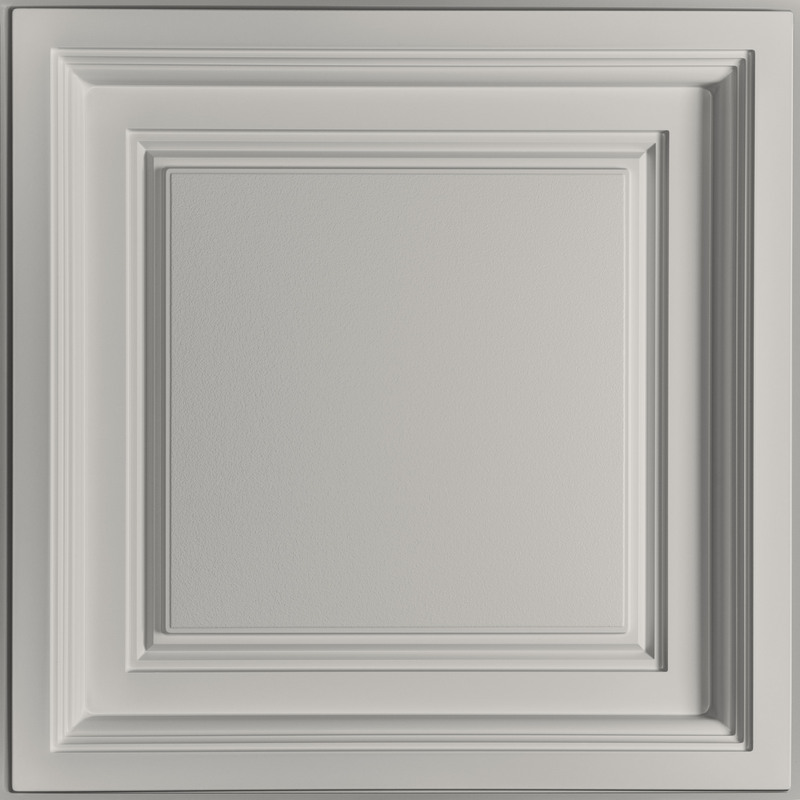 The Madison coffered tile is made of our thicker .030&quot; material and does not need the lip for stiffness and it has a slightly deeper recess than the Westminster tile. If you want to make a statement with a tile that projects downward, the Madison is the tile to use. How much clearance is required above the tile (from face of grid) to allow for popping a tile after installation? I like the Westminster tiles but I need to use the Soniguard insulation tiles as well. Do you recommend the Stratford over the Westminster when using the Soniguard tiles or will the Westminster work just as well? Hi Bill, the Soniguard will sit well on the Westminster but you will need to take a little more time to make sure the Soniguard lines up above the tiles. When you place a Soniguard in top of a Stratford, the ceiling grid aligns the Soniguard. Since the Westminster is a coffered tile that recesses upwards,The Soniguard will be sitting slightly above the grid and you'll need to place the Soniguard so the edges align. Please remember that due to the 3-dimensional profile of the Westminster, it can only be installed as a full tile. For those areas at the perimeter of the room where you may need to cut the tiles, you'll need to install the Stratford. The Stratford shares the same &quot;square within a square&quot; pattern as the Westminster but sits flush in the grid even when cut down from its full 2x2 size. The Westminster ceiling tile can only be installed as a full 2x2 tile due to the strong 3-dimensional pattern of the tile. For those areas around the perimeter of the room that are less than a full tile, you will need to use the Stratford ceiling tile which does not project down below the grid so it will sit flat in the grid. How do you install these in areas that have recessed/can lights? Is it even possible to cut a hole? I live in Jamaica and we typically have concrete ceilings ,can these tiles work on that type of surface? 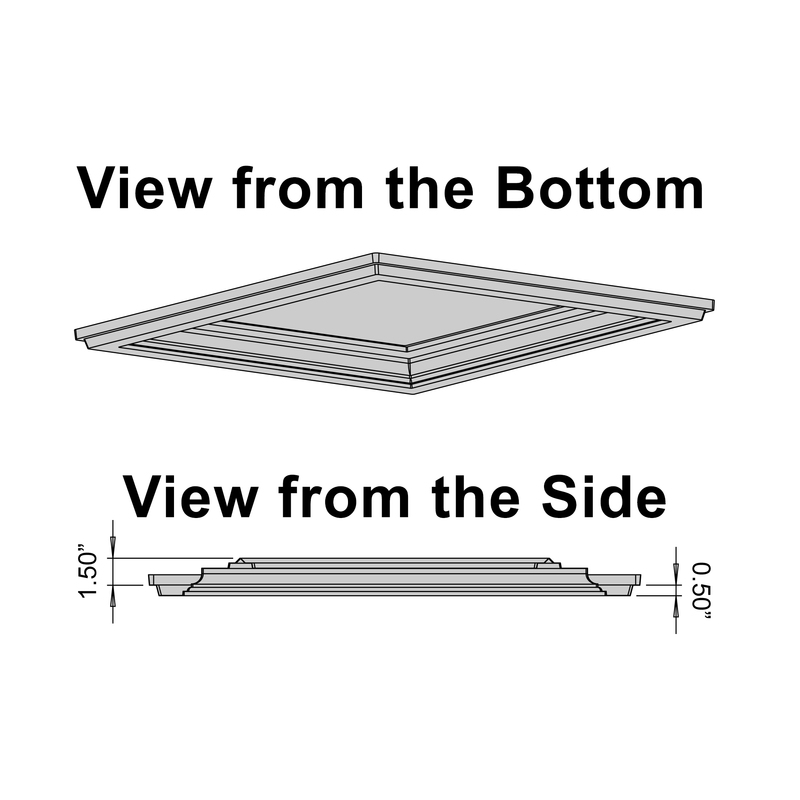 The Westminster ceiling tile is only suitable for installation in a 1&quot; or 15/16&quot; ceiling grid. Click on the following link to view all of the tiles that are suitable for a glue-up installation: http://www.ceilume.com/shop/glue-up-ceiling-tiles/ If you choose to glue the tiles to a concrete ceiling, please select an adhesive that will work well with vinyl and concrete. Rated 5 out of 5 by Ryan Kinning from We absolutely love our Westminster ceiling. We recently finished our basement and used your product in our theater and bar area. This product is perfect for those locations. It' a little extra "bling" without being distracting. I was worried about vibration with my surround sound system but I haven’t noticed any. The can lights and surround speakers fit nicely into the 2x2 panels. I have a friend that's a carpenter that came over to see the basement. He immediately went to the theater and asked who "built" the ceiling. He thought it was wood. I showed him a panel and he loved it. He couldn’t get over how good it looked. We're about two weeks from being completely finished in those areas. I will send some pics when we're done. Again, we LOVE our new ceiling! Rated 5 out of 5 by pvincen24 from Amazing Product! I can't imagine ever buying a traditional drop ceiling tile instead of the Westminster Ceiling Tiles for any application! Even though I was suspect of the idea of a thin plastic ceiling tile, I purchased them anyways and couldn't be happier. They look beautiful, are super easy to install and will definitely hold up to the wear and tear of our kids playing in the basement - they've already been hit numerous times with a basketball during pop-a-shot and have no visible markings. I didn't anticipate the compliments we'd receive as we finished the basement would be related to the ceiling. Rated 5 out of 5 by Jim Martino from I am happy to inform you that your product really work out well. The ceiling tiles are wonderful they are A-1 quality a breeze to cut and great to work with. We are very pleased. We love them so much we are going to order more for the rest of the basement. When I called for my free samples your staff were very polite and made sure I was taken care of. I am giving your staff and your tiles a perfect 10. I will NEVER buy the fiber tiles again. Rated 5 out of 5 by Sonya Tolson from I used the tile as the crowning glory in my husband's man cave which i built him as a surprise for Christmas. It is ABSOLUTELY GORGEOUS! I love it, he loves it, his friends who come to visit love it!! It was relatively easy to install, looks beautiful, and classy! I rate you guys a 5 and would recommend your products to anyone! Rated 5 out of 5 by Karen L from Great product at a great price! Got.the tile on ,Tuesday and had it all up in just a few hours. It makes my family room look fantastic. I am so happy with this product I have already recommended it to several friends.It is easy to put up and a joy to look at Thank you for a great experience and great product. Rated 5 out of 5 by Cedric Scott from The scale of 1 to 5 your product 5. They are very easy to install, they look great, added immediate style and value. Everyone raves about how good they look. Rated 5 out of 5 by RCA 55 from Amazing product Love this product. It is easy to work with, installing was very easy. The Ceilume Company makes a great product, and service was excellent.